100g Dilmah English Breakfast tea. Prepare Hollandaise and set aside. Infuse the tortellini with tea. 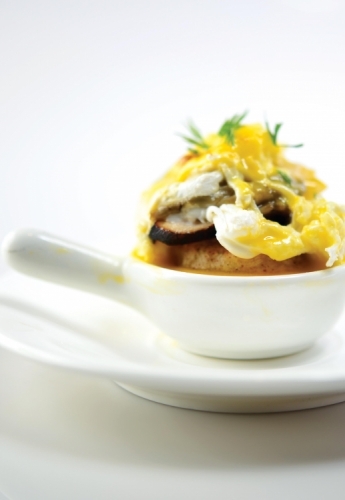 Now stack the poached egg on the English muffin with the smoked chicken and tortellini. Boil the vinegar together with pepper and shallots. Boil a large pan of water, then reduce to a simmer. Beat vigorously until the mixture forms a foam- take off heat. Whisk in the butter and return to heat. Take off heat once the butter is fully incorporated.